Kasten would also become president of the Atlanta Braves in 1986. From 1987 to 2003, the Braves won more games than any other team in major league baseball. As president of the Braves, he delegated all baseball decisions to Atlanta GM John Schuerholz, who put together strong, talented teams that consistently competed for a world championship (although only one of them actually won one; see below). The Braves of that time, under the stellar managerial leadership of Bobby Cox, were centered on a powerful pitching staff which featured Greg Maddux, Tom Glavine, Steve Avery and John Smoltz. They also featured All-Star third baseman Chipper Jones, who is regarded as one of the best hitters in Braves' history as well as one of the best switch-hitters and third basemen ever. 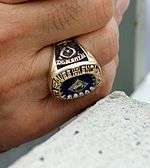 From 1991 to 2005, the Braves won 14 straight division titles, 5 National League pennants and the World Series championship in 1995 (The 1994 season was ended prematurely, without titles or postseason play, cut short by the players' strike.) In 1999, when the National Hockey League would award an expansion team to Atlanta, Kasten became president of the Atlanta Thrashers as well as chairman of the newly built Philips Arena. He held all these positions until 2003, when he stepped down, but then assumed the presidency of the Washington Nationals in 2006 under the Lerner family ownership group. 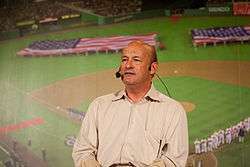 It was reported on September 23, 2010 that Kasten would step down as Nationals' team president. In January 2012, Kasten joined Magic Johnson, Peter Guber and Guggenheim Partners bidding for ownership of the Los Angeles Dodgers baseball team. On March 27 it was reported that the partnership, led by Guggenheim controlling partner Mark Walter, had submitted a winning bid of $2.15 billion (including surrounding land) -- some 25% above the nearest offer. Kasten became team president once the sale closed, on April 30, 2012. Kasten graduated from Columbia Law School while living in John Jay Hall. He is also a graduate of New York University. He had also attended Ner Israel Rabbinical College as a high school student for a short time before graduating from the Yeshiva University High School for Boys in 1969. He is married to Helen Weisz Kasten, and has four children: Alana Kasten Sonenshine, Corey (Reuven) Kasten, Sherry Kasten Marks and Jay Kasten. ↑ "Stan Kasten". www.nba.com. Retrieved 2009-08-28. ↑ "$2 Billion Dodgers Price Tag Shatters Records". Wall Street Journal Online. Retrieved 28 March 2012.